Accessories | View our catalogue products | SiliconBlue Corporation Ltd.
Thermaltake UltraX allows users to connect to the internet easily through the built-in USB port on the laptop or gaming console. 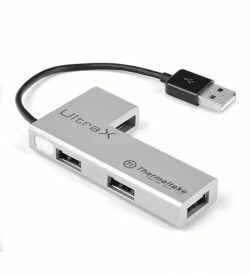 The Ultra X is an ideal solution with the slim and multi-functional design which saves valuable space and extremely easy to carry for computers that may have wireless built-in but don’t come with an Ethernet port. A combination of a 10/100M Ethernet adapter and an integrated standard 4-port USB hub in an all in one ready to use device. Featuring plug-and-play, this USB/Ethernet adapter requires no complicated installing procedures. UltraX can likewise seamlessly function under Microsoft Windows 7, 8 and Mac OS.